Acne Relife facial - Deep Cleaning and exfolication with steame and extractions. Products with antiseptical properties are used to treat current breakout and prevent feture outbrakes. for best results please discuess a series with the esthetician. 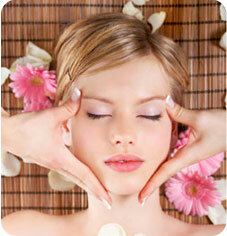 Acne back Treatment - A combination of our back facial and our acne facial to help with breakeouts on the back. Combination of our back facial and our acne facial to help with breakout on back. Like our acne facial but for various parts of the body suffering from minor breakouts. Grate warming treatment any time of year. Prompts relaxation, alleviates stress, improves circulation and is cleaning. Helps with muscle acnes and pains.